Quinn G. Perini Professor Jill E. Abramson speaks about the impact of the press on the political world at the IOP on Tuesday evening. She covered the hearings for Supreme Court Justice Clarence Thomas as a reporter for the Wall Street Journal and co-wrote a book on the topic with Jane Mayer. She currently teaches in the English department. "I wanted the truth. I thought that her story sounded very credible, her vivid description of what happens, how terrified she was… just the level of detail and the fact that she was so reluctant to be identified and come forward." 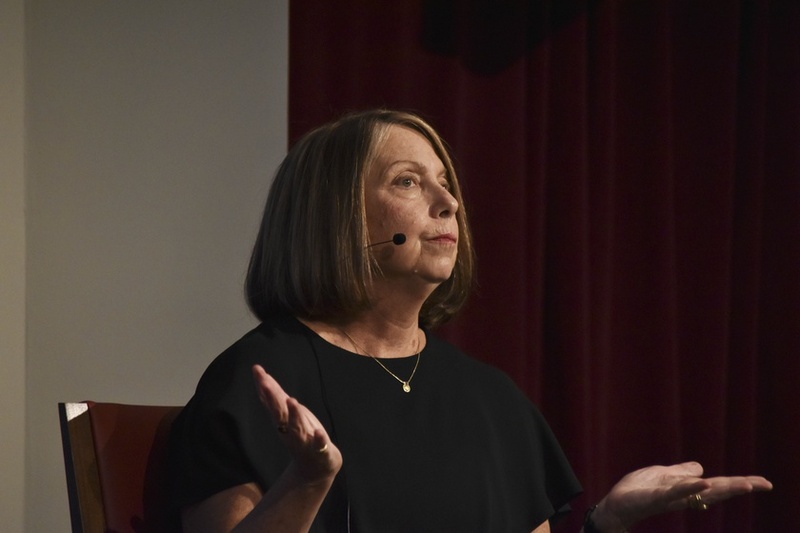 Professor Jill E. Abramson covered the Clarence Thomas hearings as a reporter for the Wall Street Journal and co-wrote a book on the topic with Jane Mayer. She currently teaches in the English department. Prior to Harvard, she served as the executive editor of The New York Times. Here, she talks with Fifteen Minutes about the politics of allegations, ethical journalism, and what’s changed over the past thirty years. This interview has been edited for length and clarity. FM: When you first heard about Dr. Ford’s allegations against Brett Kavanaugh, did you immediately draw a connection [to Anita Hill and Clarence Thomas]? FM: Do you remember having a similar reaction when the Anita Hill accusations came out? JA: Neither of these women were political figures. Neither Anita Hill nor Christine Blasey Ford. So what would their motive be, exactly, except they felt the call of citizenship to make their allegations known, because they speak directly to the suitability of a Supreme Court nominee who will have lifetime tenure? FM: When you were covering Anita Hill, do you remember noticing more resistance among your colleagues and people you were talking to? Did people seem more reluctant to believe her [than they did Ford]? JA: I worked at the Wall Street Journal then, in their Washington bureau. And I never polled my colleagues, but I think certainly after her testimony, most of the reporters, I would believe, believed her over Justice Thomas. Because I remember we were all surprised at the instant — I think this will happen with Kavanaugh too — the instant reaction… The polls back in ’91 showed that more Americans believed Clarence Thomas than believed Anita Hill, but a year later that had completely flipped. And the anger of women over his confirmation just built. FM: When you sat down to watch the hearings last week and as the day played out, did you think they were going to end the way they did? I did. I wrote an op-ed in the New York Times that ran the day before the hearings saying that it was designed to end in a he-said-she-said stalemate. The strategy of the Republicans back during Anita Hill was that they designed the hearing to end in a he-said-she-said stalemate, where the accuser would be the lone woman accuser. That was very important. They felt back then — and I think it’s the same way now — that a second accuser would really put the nominee in danger. So the processes were both stacked against the accuser and, I think, unfair, with a predetermined outcome to confirm the nominee. FM: As a journalist, do you think that the way the Kavanaugh hearing was covered contributed to how things turned out? JA: I think journalists did a good job covering this. I would exempt Fox News, which was full of guest contributors who were very personally insulting to Dr. Ford. But for the most part, I think journalists did a good job. I think the Washington Post did a wonderful job with that first interview of her; it was very thorough, very fair-minded. And the New Yorker – Jane Mayer, Ronan Farrow found Deborah Ramirez, the second woman. That was very significant. JA: But there was no Internet. FM: Right. Do you think that social media might spur something else on the far-right side that wasn't possible during Anita Hill? JA: Sure, on both sides. Social media is being used by activists who are outraged by the outcome to organize and get people to protest. You know, the #metoo movement was so powerful on the internet. I think in a similar way, on social media, there were a lot of women saying that Dr. Ford's allegations brought up they had a horrible high school experience, too — it really touched a nerve, and people were on Facebook and Twitter and other platforms talking about sharing their experiences too. So it will be on both sides. JA: Right, I'm like a walking satire of the hated symbols of the liberal elite. Plus I’m from New York City, so. JA: You know, I guess my position is: I'm a truth-teller. And with Harvard and “veritas,” the whole mission of Harvard is to open students' eyes to the truth, and the traditions of truthfulness. And The New York Times is the gold standard of journalism, you know, look at this [holding up front page of The New York Times] flawless investigation into Trump's wealth that three reporters spent more than a year on. That's the truth! The attacks are predictable and, I think, have to be responded to. FM: Do you think that these institutions need to be making efforts to in some way mitigate the polarization? JA: In my seminars, I scour the applicants for any sign, I so want conservative students in my classes. And I've had some. Because sure, you want to include, you want to consider everything they have to say, and how they may look at issues and stories differently. I hope to turn them on to the importance of truth-telling and digging and investigative journalism. FM: So you feel that there are ways that you can lead productive conversations? FM: Having watched the country react to Anita Hill — on the micro level that you were reporting and writing, but also just over the past thirty years — what do you think is in store? Are you hopeful? JA: I'm always hopeful. I mean, how can you go through life and not be hopeful? But I'm honestly hopeful. And I think we are seeing ideological see-sawing. We did have eight years of President Obama, and very different policies. Now we have Trump, but that's not going to last. I think his administration has done abhorrent things — to the climate and immigrants and trying to abolish healthcare — but politics goes in cycles. This will not last forever. And my suspicion post-Kavanaugh is that there are going to be a flood of women coming to the polls.